A source of pride and joy for our organization is our Astronomy Education Center. Through the telescopes housed there, the exhibits, and other features, we bring the wonders of the Universe "down to earth" for us to enjoy and to share with our guests. 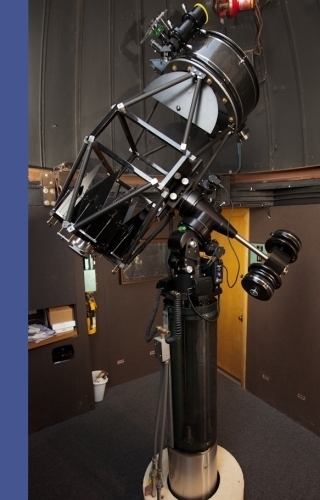 The NAA has operated the Glen D. Riley Observatory (GDRO) since the club built it in 1973. It was dedicated to the memory of the physics teacher who had sponsored the group during its beginnings as a high school club. The observatory has been an anchor for the NAA in all the years since, and the focus of many club activities, both public and private. Over the years, the domed observatory has not stood still. Relocated and redesigned twice, we have always been guests on the property of the City of Naperville's Springbrook Water Reclamation Facility. In a project started in 2012, the telescope was created to replace the 10" reflector which had served in the GDRO for almost forty years. The 16" telescope was designed to give the best viewing possible from under our Chicagoland skies. It is a one-of-a-kind instrument which we built especially for the GDRO. 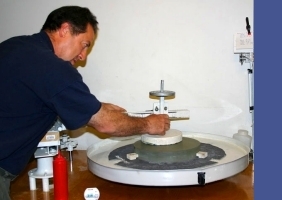 Its f3.5 primary mirror, with a surface curve accurate to one one-millionth of an inch, was ground by our master optician, John Abrahamian. The telescope was designed by member Drew Carhart, who also fabricated most of the over 200 custom-machined parts that make it up. 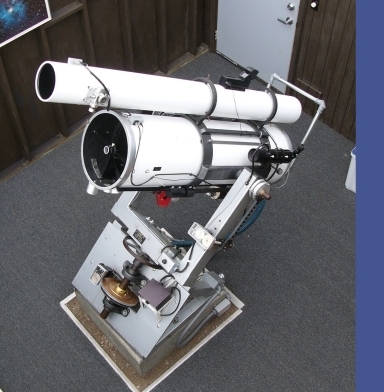 It is mounted on a Losmandy Titan German Equatorial mount, which can steer the telescope to targets selected either using the mount's controlling computer, or by using sky charting software on an iPad. 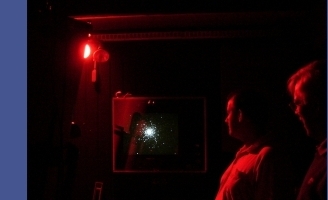 Visitors can "follow along" as the screen of the iPad is displayed on a wall monitor near the telescope; information about the objects being viewed can be readily accessed. 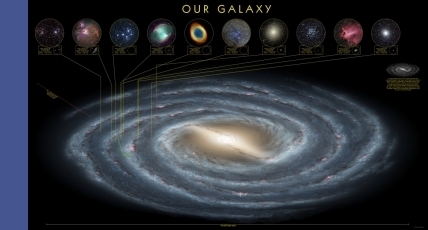 The GDRO also has an educational exhibits room that includes a scale representation of our solar system and a wall-sized depiction of our Milky Way galaxy showing locations of some of the objects we view through our telescopes. 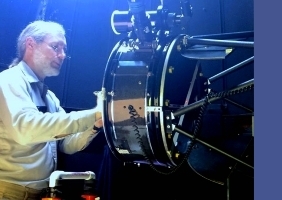 The NAA began building and equipping its second observatory in 2002. The roll-off roof DuPage Valley Observatory (DVO, named after the Astronomy Education Center's location, overlooking the DuPage River) houses two telescopes also crafted primarily by members Abrahamian and Carhart, but these telescopes do not feature eyepieces for visitors to view through. 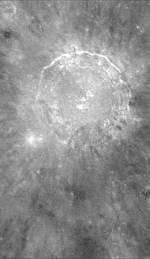 Instead, special, sensitive video cameras allows us to take live images of celestial objects. We think that looking through a telescope and seeing the universe first-hand is a tremendous experience, but unfortunately, the amount of light pollution in our skies has increased over the years to the level where the human eye can no longer pick the fainter objects out of the skyglow. The video setup allows us to pick out the "hidden" light of the fainter celestial objects and amplify it, enabling us to once again provide views -- now on a set of video monitors -- of objects that light pollution had taken away from us. 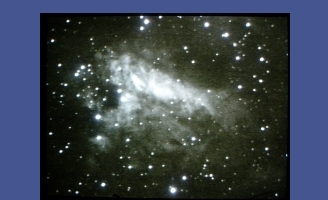 And objects which we can still see visually can display wonderful detail when imaged at the DVO, like Messier 17 -- the Swan or Omega Nebula -- shown here in a snapshot off one of our monitors. We have imaged galaxies down fainter than 17.5 magnitude, and stars fainter than 18th -- in real-time, under suburban skies! The office room of the DVO was also designed to house our club's library of almost 500 titles in a climate-controlled space. 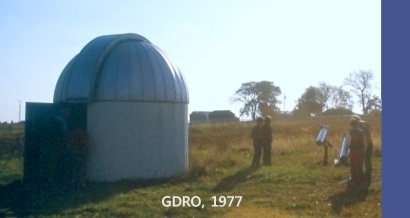 The GDRO was first built as a place for members of our club to gather and view the wonders of the heavens. But from early on, much of its use became centered on our public outreach efforts. As the facility evolved over the years, we've put a lot of effort into developing it into a place where our fellow citizens can experience thrill of exploring the Universe first-hand. We hope you will join us! Watch our Calendar page for upcoming public events at the AEC (and elsewhere). Contact us about setting up a visit to our AEC for your youth or community group. Make us a favorite on Facebook, to see postings about our public activities. All of our outreach is done free of charge. We look forward to seeing you under the stars! Some hidden keyword text: Naperville Astronomical Association Illinois observatories public observatory youth groups free stargazing star parties telescopes.